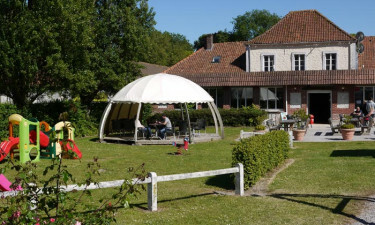 La Bien Assise luxury camping site is conveniently located in Guines, Picardy, making it easily accessible via Calais ferry port. This peaceful and well-maintained park sits in the grounds of a traditional French château, providing a spacious, wooded haven for holidaying families. While you are not permitted to take your own camper or tent onsite, you can choose from various luxury mobile home accommodations. The park provides excellent amenities to ensure your stay is pleasant, so why not book with LUX-camp today? Welcome to La Bien Assise Campsite. What stands out about La Bien Assise luxury camping site? Picturesque park, close to other tourist hotspots. Pool complex for adults and children. Interesting choice of physical activities. 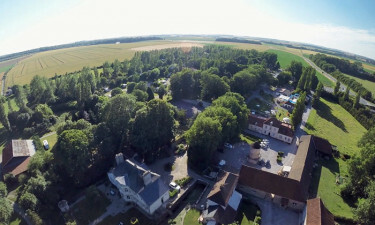 This tranquil, French hideaway is perfect for travelling families, as getting to La Bien Assise camping holiday resort could not be made easier. Thanks to the Euro tunnel and a steady, regular ferry crossings, you can take your car and enjoy the scenic route to Picardy, which is only 14 kilometres away. Even if you do not fancy driving, the ferry trip is a lovely way to start your holiday. Trains and buses run a regular service from Calais; the journey is an ideal way to sightsee the traditional, lush landscapes along the way. This is luxury camping at its best as the onsite pool is heated and has a retractable roof for when warmer climes approach. For the kids, there is a smaller outdoor pool with a little fountain and water slides to play on. Sun loungers are provided for those who just want to top up their tan. If you like tennis, a court is provided as well as three table tennis tables, a volleyball net and crazy golf. If you want to venture further afield, there is a wide range of sports and water-inspired activities to choose from. 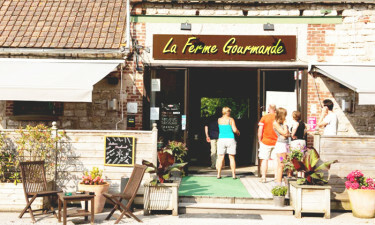 The park has a resident restaurant, La Ferme Gourmande, which has terraced seating and offers a menu of international and local fare. There is also a take-away and a small grocery store. Finally, do not forget to have a chilled glass of wine in the bar!